With mind blowing experiences and thrilling rides, the Ferrari World awaits you. 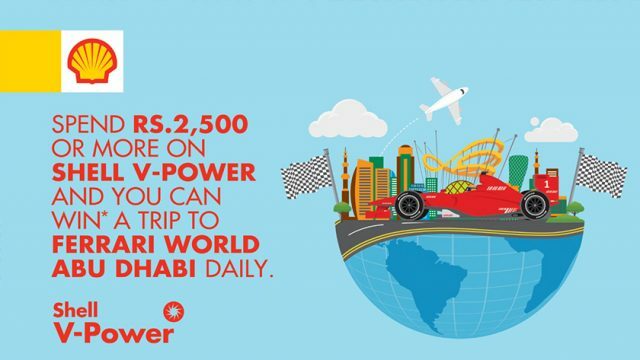 Shell V-Power brings an adventurous trip for its loyal customers. To avail this trip full of adventure, all you need to do is buy Shell V-Power worth 2500 Rs and get a chance to enter a lucky draw. The lucky winner will get a chance to win a free trip to Ferrari World Abu Dhabi. Speaking about the Ferrari World, it is an amusement park in Abu Dhabi, UAE. It is the first Ferrari themed park that has the world’s fastest roller coaster – Formula Rossa as the biggest attraction. So, who would want to miss a chance to win this Shell sponsored free trip? Over the years, Shell is proud to run great campaigns for its consumers. The offer is starting from the 13th of April 2018 and people will get a chance to win a free trip daily till the campaign ends. It is to be noted that the winner will be selected through a lucky draw, which will take place at the end of the campaign. So, what are you waiting for? Get your fuel tank filled with the finest Shell V-Power for 2500 and get ready for the crazy adventures.